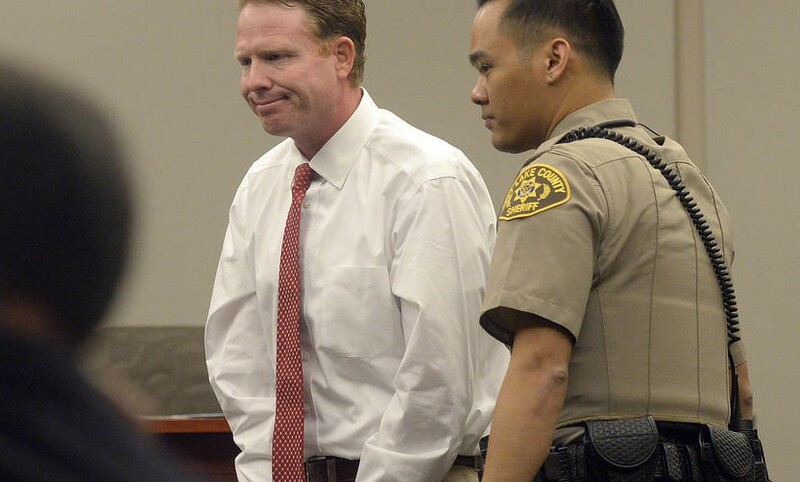 Jeremy Johnson pled the Fifth on Wednesday and was held in contempt of court. He now faces 30 days in Salt Lake County Jail. The reverberations from the explosive lunchtime news in today's hearings regarding a key witness scheduled that day for the John Swallow trial rippled in multiple directions. Jeremy Johnson, a witness for the state, intended to take "the Fifth," his attorney told Third District court, something City Weekly exclusively tweeted Tuesday after the lunch recess. 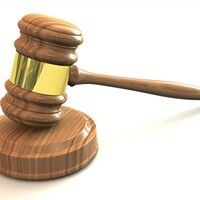 During lunch, a reporter overheard prosecutors expressing frustration at the 86 counts federal prosecutors had filed against the onetime online marketing business giant Johnson several years ago. He'd ended up convicted of several counts of making false statements to banks and got 11 years. 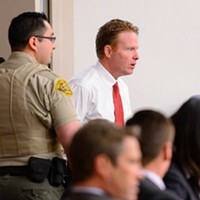 Swallow trial: incarcerated businessman and witness Jeremy Johnson testify tomorrow. Overheard he might plead fifth as he's pissed at Feds. "I just think charging 86 counts was stupid, number one" a prosecutor opined. "Number two, why won't they ever think about other prosecutions their actions may impact, because I think they're notorious for that." "If we don't have him, we're going to lose a whole bunch," a second prosecutor noted about Johnson apparently declining to testify. The first prosecutor suggested that Salt Lake County D.A. Sim Gill should call up Utah United States Attorney John Huber to see if he would offer immunity. Johnson's decision to plead the Fifth, meant that the state was down a witness who linked Swallow to attempting to bribe former Nevada Sen. Harry Reid, unless the federal government could convince Johnson that its word was its bond. The defense meanwhile had to rework its strategy. Four of the 13 charges against Swallow involve Johnson. Johnson's attorney Mary Corporon told Judge Elizabeth Hruby-Mills Wednesday midday, that Johnson did not trust state or federal guarantees of immunity in order for him to testify at Swallow's trial. Corporon said that Johnson's experience with the federal government had shown him that "any scintilla of disparity" between his testimony in court on Swallow and prior testimony, "the federal government would be proceeding against Jeremy Johnson with a vengeance." She said it was "not the experience of my client" that the federal government comported with the rule of law and acted in good faith. A second attorney for Johnson, Karra Porter, told the court that prosecutor Chou-Chou Collins and several FBI agents had visited Johnson six or seven weeks ago in prison, and he had indicated at that time his reluctant to testify. Porter was critical of one FBI agent, she said, who while involved in an agreement of immunity to Johnson prior to being interviewed by the feds, "had gone and blabbed immunized information" to a federal agency that was investigating him. Shortly after Johnson's attorneys had outlined their concerns to the judge, the chief of the Public Integrity Section of the Department of Justice, Raymond Hulser, sent over a letter stating that they were bound by a promise of immunity made by Salt Lake County D.A. Sim Gill to Johnson. Corporon remained unimpressed, arguing she could not "in good conscience" advise Johnson to waive his Fifth Amendment privilege. Hruby-Mills found the letter persuasive, however, and "did not believe there was any risk of prosecution" for Johnson. She ordered Johnson to testify, even though his attorney had advised him not to. Johnson came into court in his trademark white shirt and colorful tie, but noticeably thinner after months of serving his sentence. He was also visibly agitated at the situation he found himself in. When he took the oath, he held up his manacled hands, the fingers splayed in the air. In response to a question from prosecutor Fred Burmeister, Johnson said he understood that "it's not in my best interest to answer any questions." Burmeister asked the judge to order him to testify and when Johnson refused, Hruby-Mills found him in contempt and sentenced him to 30 days at the Salt Lake County Jail. He's to return to court Thursday morning to see if he's changed his mind. Much of the rest of the day's proceedings, by contrast, were sedate. In a trial that has focused more on several men supposedly not in the cross-hairs of state prosecutors than on the man sitting at the far end of the defense table, it can seem a little odd when someone has a good word to say about one of the secondary characters in this sprawling, decade-plus old saga. 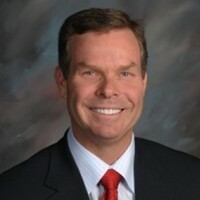 Case in point Timothy Lawson, the alleged "fixer" of former AG Mark Shurtleff, a man repeatedly characterized in court by witnesses as an "intimidator," someone who issued threats and demands for money with menaces and labeled himself as a modern day Porter Rockwell, the fabled enforcer of LDS church prophet Joseph Smith. 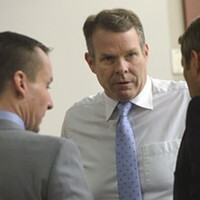 Cara Tangaro (left), Brad Anderson (center) and Scott Williams (right) surround their client, John Swallow. 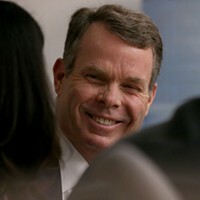 Shortly after 10.30 a.m., John Swallow's defense attorney Scott Williams offered a different perspective on Lawson, one authored by Utah governor Gary Herbert back when he was Lieutenant Governor in 2009. In a short letter Williams had put into evidence as a counter-balance to what he called the "trashing" of Lawson's reputation, he read out the letter to Judge Hruby-Mills outside of the presence of the jury. 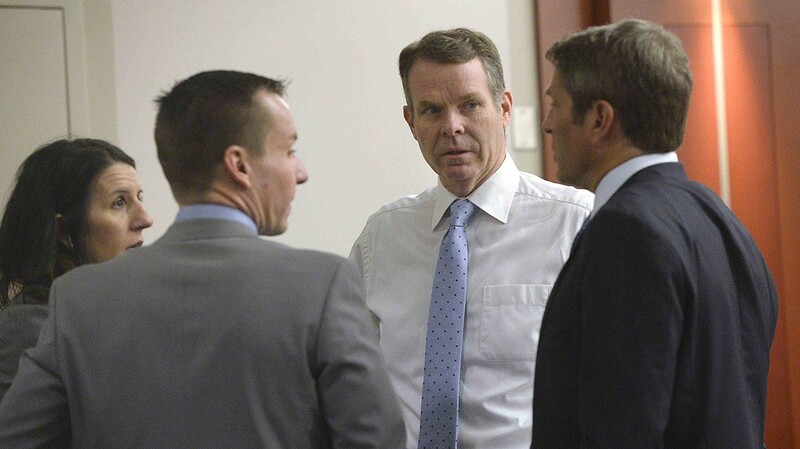 Herbert described the late Utah County operative Lawson as "a man of honesty and integrity," something starkly in opposition to the man the jury had heard discussed in testimony in prior days. Prosecutor Collins quickly countered, soliciting testimony from longtime Attorney General criminal prosecutor Scott Reed regarding texts from Lawson to a woman involved in Mark Jenson's central Utah golf and ski resort that were threatening and contained "sexual innuendo," Reed recalled. Reed testified that he'd advised Shurtleff they could not do a plea in abeyance with Jenson, having already talked to the latter's attorney Greg Skordas about his client pleading guilty to several felonies. But, Reed recalled, Shurtleff told him he'd already agreed to it. Reed described Shurtleff's communications with Jenson as "inappropriate," and while he viewed critically Shurtleff going to Pelican Hill on Jenson's dime, Swallow wasn't a problem, he told the court, because at that time Shurtleff's chief fundraiser was not employed by the AG. Testimony Wednesday also focused on the $1 million houseboat Johnson owned that he leant to Swallow for personal use. The state led Connor Vaughn Hansen, a concessionaire manager of houseboats at a marina at Lake Powell, through an estimation of the nightly rental cost of a houseboat similar to Johnson's—which would have to include a helicopter landing pad on the roof among other luxury items—that totaled $2,650. Defense attorney Williams then asked Hansen if it was against the law for a private boat owner to rent out his boat. Hansen replied yes.